Charles Connick, “the world’s greatest contemporary craftsman in stained glass.” Carved in golden oak by F.W.Allen in exchange for a window for his studio now in the MFA collection. Exhibited at MOMA. I saw at the Boston Art Club, a bust of you carved in wood. I think I have never seen a more perfect likeness of anyone in any medium. I think it is a marvelous thing. Allen certainly deserves enormous credit for the artistic qualities of it and you are to be congratulated on having so splendid a portrait of yourself for future generations to admire. Charles J. Connick (1875-1945) opened a studio in Boston in 1913 on Harcourt Street at the Copley end of St. Botolph Street, just a short walk down Huntington Avenue from the Museum of Fine Arts. There he built his reputation as a stained glass artist in the Gothic Revival style where he produced richly colored windows for institutions and places of worship throughout America and abroad. He won a gold medal for his work at the Panama Pacific Exposition and produced the rose windows for the Cathedrals of St. John the Divine and St. Patrick in New York City. The Heinz Chapel at the University of Pittsburgh boasts 23 windows by the Connick Studio including the transept windows, which are among the tallest in the world at 73 feet. At the height of his career in 1930 his studio employed 40-50 artists and craftspeople committed to working collectively “with one mind and one pair of hands” in the spirit and practice of the artisans of the 12th and 13th centuries. Charles Connick was active in the Boston Art Club where Frederick Allen exhibited this bust. The show prompted Vesper George to write the glowing letter above. Connick and Allen most likely came to know each other through the Architect Ralph Adams Cram. Connick and Cram had know each other since 1902 and Cram had called on Allen to do sculptural work for Wheaton College and Church of the Advent, Boston. 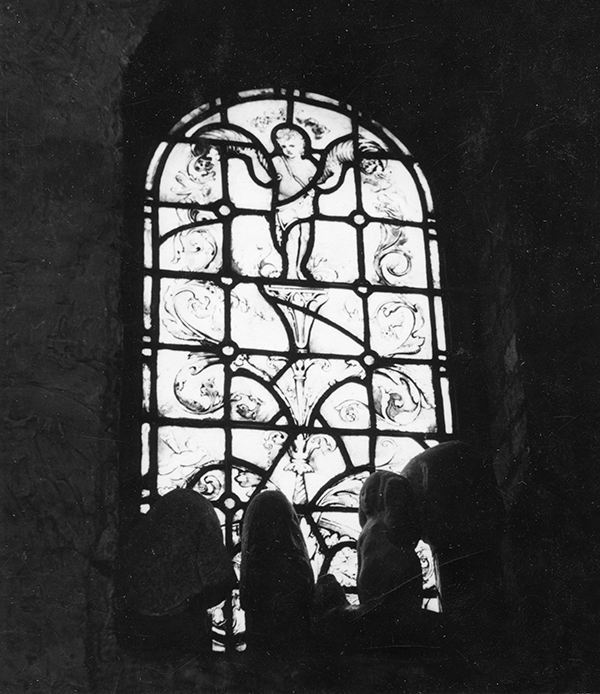 Allen came to Connick about creating a stained glass window for his Italianate Studio on Tavern Road. 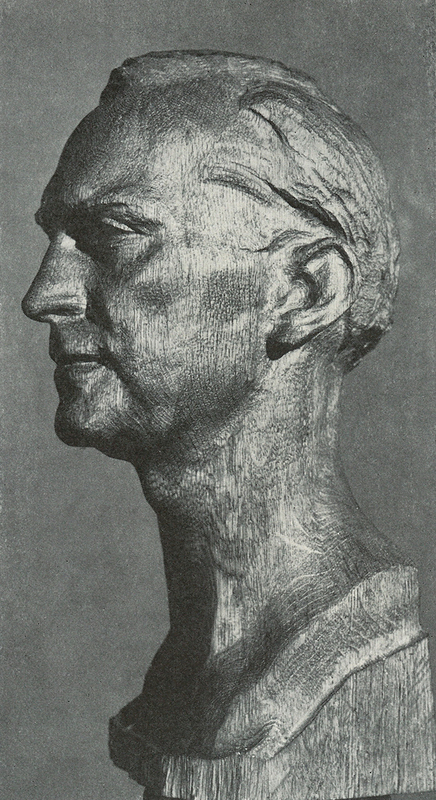 In exchange, Fred would sculpt Charles’ portrait. He chose wood. Like stone, wood carving is a reductive art and challenging to do well. Whatever is removed from the whole cannot be replaced. The natural form and grain must be considered in the design and whether the lines of the piece of wood chosen can contribute to the design. Allen taught wood carving in his course work at the Museum School and some naturally took to it. One student in particular is Merrilyn Delano Marsh who has done uniquely creative and interesting work, some of it polychromed. She related a time when her class went to the beach and chose pieces of wood to carve. That was the beginning of a love affair between her and that beautiful responsive medium. Merrilyn Delano Marsh: A Retrospective (ISBN: 978-0-692-24893-5) One section is devoted to her wood sculptures. Merrilyn pointed out how a branch or burl or bump in the wood inspires the sculptor to design creatively. Looking at the portrait, you can see in the carving examples of his teaching. The central grain of the wood is vertical, creating the erect position of the head on the neck and the bright smooth planes on the skin surfaces of the face. The planes have been polished to create highlights. The hair is carved with a gouge across the grain adding texture for contrast and a darker color in the hollows and the roughness of the carving. It’s also darker when the end grain shows, for example in the cut-away under the hair at the nape of the neck, under the cheekbone and jaw line where a shadow appears to form hollows. Notice at the angle of the shoulder where the grain changes as it would where a branch grows from the trunk. The growth pattern is used there to accentuate the change from the round “trunk” of the long neck transitioning into the more horizontal lines where it cuts away to become the shoulder and then downward toward the chest, undulating along and around the collar of the long neck as around the collar of a branch. Notice how the grain forms the contour of the Adam’s apple, the shape of the jaw line and the cheek above it. Other light lines in the surface of the graining almost look like wrinkles in the skin. There are places where the wood has been rasped to make it darker for a shadow or contour. Tooling marks show the hand of the sculptor. Here the hand is masterful. It would be so interesting to see how he used the wood on the opposite side of the portrait but, unfortunately, the bust is still missing in spite of attempts to find it among art collections, historical library records and museum archives. For more information on Connick, there is an out-of-print booklet called Singer in Light-Charles J. Connick by Rollo Walter Brown, reprinted from the University Review (October, 1941), Quarterly Journal of the University of Kansas City. 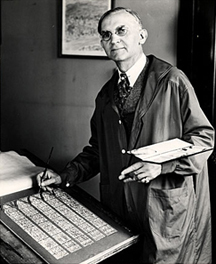 Connick was a principal collaborator with the architect Ralph Adams Cram, crafting fabulous windows for his many church projects including the Cathedral of St. John the Divine and St. Thomas Church in NYC. His studio produced 15,000 windows for 5000 churches. Also note that the metal worker, Frank L. Koralewsky was the maker of wonderful forged hinges, locks, gates and ornamental ironwork for Cram. He also worked closely with Connick.